Today’s celebrities have it much easier than fashionistas of the past. One minute they can sashay on stage donning a slab of meat and the next minute slip into a velour tracksuit with some catchy double entendre/logo splashed across their derriere. (I am so fashion ignorant that whenever I see the Juicy Couture logo across someone’s chest, I immediately wonder if they are lactating.) Liberated women (aka prostitutes) of the past were stuck wearing the same clothes day in and day out. The following is a brief history of how to dress like a prostitute. In Ancient Assyria, respectable women could not leave the house without wearing a veil, but prostitutes did not have to cover up. In fact, if a prostitute dared to wear a veil then they were punished with a 100 lashes. What are sometimes referred to as “tramp stamps” today, may have identified ancient Egyptian women as concubines. Several preserved mummies of dancers and concubines have been found with geometric designs tattooed on their bodies. The best example is Amunet Priestess of Hathor found inked up with parallel lines on her arms and thighs and elliptical patterns below her navel. By the time Ancient Rome was in full swing (and roads were paved), prostitutes became so ubiquitous that authorities needed a way to distinguish women of the night from the more respectable matrona. Enter the blonde bombshells. Roman sumptuary laws required prostitutes to identify themselves by wearing a blonde wig. The theory went something like this; if only whores are blonde then aristocratic women would naturally want venerable dark hair. Unfortunately, most women were quick to figure out what Miss Clairol new all along – Blondes have more fun. 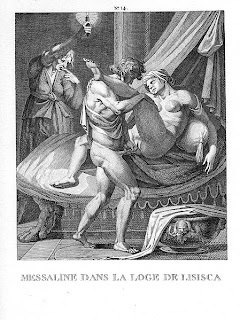 Famed bad girl, Messalina certainly wasn’t going to stay cooped up inside brushing her dark locks. She was rumored to sneak out at night to Rome’s red light district hidden beneath an ash-blonde wig. Sometimes she even staggered home without her yellow hair, only to have it disgracefully returned in the morning. Eventually, Messalina's party going ways left her blonde head a tad shorter when she seduced Roman Senator, Gaius Silius. Her husband, Emperor Claudius ordered Messalina's death and traded her in for a far less forgetful, Agrippina the Younger. Stay tuned for part two : The Fashionable Renaissance Prostitute. And I was just thinking the other day that there is no longer any way to distinguish hookers from respectable women. Interesting glimpse at history. Love it! Fascinating. I am looking forward to Part 2. Very interesting! I had not heard about the tats on Egyptian prostitutes though I knew about the blond wigs in Rome (I've often wondered about how that early association continues to play out today...). Hi Mary, You should have seen the things I wore as a 16 year old. (I used to hide my clothes under sweat pants from my very strict mother). Amy - part 2 is better because I am going to cover courtesans. very scandalous. Vicky, you MUST read Joanna Pitman 's book: On Blondes. It traces the whole history of myth and meaning behind blonde hair. I couldn't put it down and I am not even blonde! Very interesting post! What a fascinating subject. I love anything about unconventional women; viragos, courtesans, mistresses, warrior women, professionals, and regents. I read that formidible Renaissance tyrant Giovanni II Bentivoglio was utterly ruled by his Sforza wife, Ginevra! I've been searching for information on Cesare Borgia's Roman mistress, the courtesan Fiammetta de Michelis. Have you seen any sources for this mysterious lady? I am looking forward to your next post about courtesans during the Renaissance! Hi Brooke, you and I both have the Italian Renaissance addiction. It's funny because Cesare's mistress always comes up as one line or two in various books but I never hear anything more about her. It's so frustrating! You have probably already read Hibbert's The Borgias and their Enemies. I think he mentions her but that is about it. If I find anything, I will let you know.